Firstly, the principle of divisibility was permitted to fragment ad infinitum and therefore neither the division nor the unity can be construed in mathematical terms. Secondly, the Infinite is beyond Space and time while the multiplicity exists in the matrix of space and time so that any relation between the two dimensions has to be done in experiential and not in either logical or metaphysical terms. Firstly, the essence of the Oneness is preserved in every divisible form as the Self or Purusha. In other words, the One Self replicates itself through multiplicity of soul-forms. 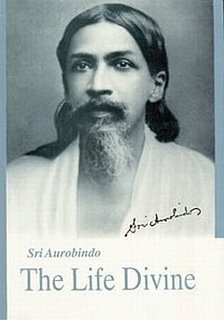 Sri Aurobindo describes that this is why the Sankhyas speak of the multiple Purushas (The Life Divine, pg 178). Secondly, all divisible forms exist in the same matrix of Nature or Prakriti. In other words, the ‘multiple Purushas do not each inhabit a separate world of its own, do not each possess a separate Prakriti building a separate universe, but rather all enjoy the same Prakriti, -- as they must do, being only soul-forms of the One presiding over the multiple creations of His power’ (Ibid). Firstly, the concept of the single matrix of Nature or Prakriti allows the relation between the different soul-forms to occur. This is how each soul-form can identify with other soul-forms. As a corollary, this leads to the identification of the individual soul-form with the Universal soul-poise of the Absolute. If every soul-form inhabited a separate island of Nature, there could not have been possible any relation between the different soul-forms. The very phenomenon of relationship requires a matrix where the relationship can occur for this cannot occur in a vacuum. ‘The Purusha in each form actively identifies himself with each; he delimits in himself that and sets off his other forms against it in his consciousness as containing his other selves which are identical with him in being but different in relation, different in the various extent , various range of movement and various view of the one substance, force, consciousness, delight which each is actually deploying at any given moment of Time or in any given field of Space’ (Ibid, pg 178). He has fashioned these countless persons of one self..